Chris Graythen/Getty Images)Robert Kraft is often seen rocking his Patriot-inspired Lunar Force Nike sneakers at games. Robert Kraft, the billionaire owner of the New England Patriots, may not come to mind when you think of influential trendsetters. 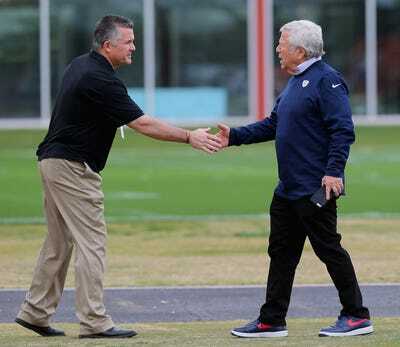 But when Kraft could no longer bear the pain from dress shoes during long games, he reached out to Nike for a custom pair that would provide some relief. Not only did Kraft get a custom-made shoe, but he also landed an influential shoe deal. His Patriots-inspired Lunar Force Nike sneakers sell for $US140 a pair, and proceeds go to the Boys and Girls Club of Boston, where his son Josh is CEO. Robert Kraft, the 77-year-old owner of the NFL’s New England Patriots, isn’t someone you’d label as a fashion trendsetter at first thought. But the billionaire is among the increasing number of non-athletes sponsored by big-time sneaker companies. Kraft has long been a fan of Nike sneakers, mainly as a more comfortable alternative to the dress shoes more commonly associated with his social class. 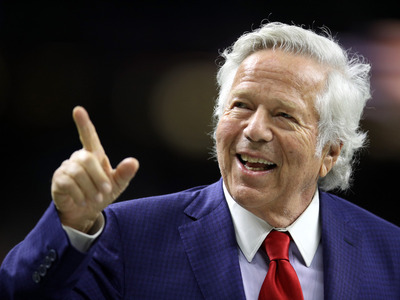 Kraft’s passion for football – and for the Patriots organisation specifically – began in his youth. After playing running back at Columbia University, Kraft, based in Massachusetts, was a 23-year New England Patriots season ticket holder before buying the team. Kraft bought the Patriots in 1994, and it was the first year the team made the playoffs in eight seasons. Since then, the team has had 20 winning seasons, 16 division titles, eight conference championships, and five Super Bowl wins. 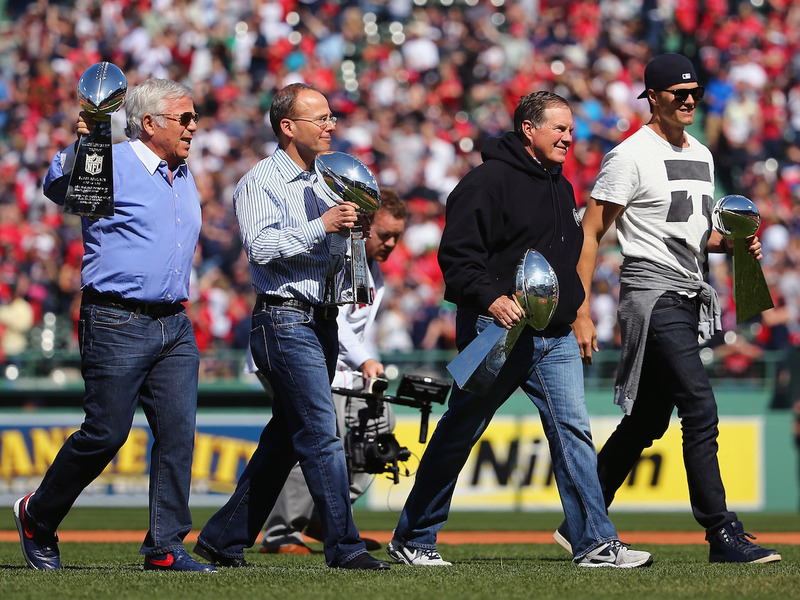 Maddie Meyer/Getty ImagesFrom left, Robert Kraft, Jonathan Kraft, Bill Belichick, and Tom Brady carry Vince Lombardi trophies onto the field at Fenway Park on April 13, 2015. But all that time on his feet – in dress shoes and a suit – resulted in uncomfortable foot pain for the former athlete. The owner took to wearing sneakers, specifically the Nike Air Force 1, with his suits. Kraft took it one step further by reaching out to Nike for a custom pair with more support, and the company responded by developing a custom pair for him. Often Kraft would show up to games and events in different versions of Nike’s Air Force 1s, including a custom bedazzled red, white, and blue version like the ones he sported during a game against the New York Jets in 2014. In 2014, Nike released its first version of the Patriots-inspired Lunar Force 1, and the pair sold out in less than 10 minutes, CBS Sports reported. 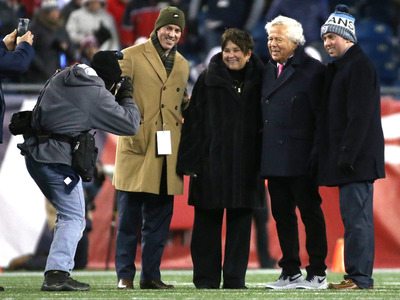 Elsa/Getty ImagesRobert Kraft, right, sporting a pair of Nikes. The Kraft-Nike collab sneaker sells for around $US140, when available, and all proceeds from the shoes fund fitness programs at the Boys and Girls Clubs of Boston, whose CEO is none other than Kraft’s son, Josh Kraft. In 2017, the billionaire’s shoe got a sleek redesign to reflect the team’s fifth Superbowl win earlier that year. The Air Force 1 Ultra Flyknit Low RKK came with five pairs of removable Velcro patches – one for each Patriots championship up to that point – and a note from Kraft reminding the purchaser of the charitable mission of the shoe deal. “I’m comfortable, get a little street cred, and get some money for a great charity,” Kraft told Bloomberg of the shoe. Jim Rogash/Getty ImagesKraft in his Air Force 1 Ultra Flyknit Low RKKs at the AFC Divisional Playoff game against the Tennessee Titans in January 2018. Earlier this year, Kraft was photographed wearing his Nikes to New York City’s exclusive Met Gala, People reported. He’s also worn the special kicks to the Academy Awards and the Grammys, according to the Boston Globe. After the success of the shoe collab with the team’s owner, Nike issued a Patriot-Nike edition of the Air Force 1s in 2017 to commemorate New England’s 25-point Super Bowl comeback against the Atlanta Falcons. The one-of-a-kind Air Force 1 Low SB51 Comeback sneakers were made from two footballs (including laces) used in Super Bowl LI. The single pair was auctioned off, and profits went to the Boys and Girls Club of Boston.